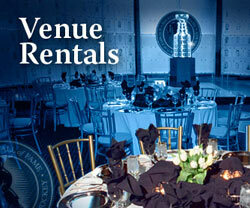 Michigan State University has its Spartans, and carries with it a proud heritage of hockey excellence through the years. The Miller family has certainly contributed to the legacy  an astonishing ten members of the Miller clan have worn the Spartan sweater over the decades, including the most recent, Stanley Cup champion Drew Miller. Drew's grandfather Butch, father Dean, uncle Lyle, brother Ryan and cousins Kelly, Kevin and Kip Miller have all starred as Michigan State Spartan hockey players. So, when Drew Miller had July 5 to plan for his day with the Stanley Cup, there was no doubt that a trip home to East Lansing, Michigan and to his alma mater was part of the plan. Drew made his NHL debut with the Ducks during their playoff drive, and added some real moxy to the line-up. And what an introduction! His first NHL games and a Stanley Cup victory within weeks. Unbelievable! Drew got his first taste of 'the show' on April 19 against the Minnesota Wild, and then was added to the lineup against the Ottawa Senators in the Stanley Cup Final on May 28 and 30. The Stanley Cup arrived and was taken first to the Miller family home, where family and a few close friends ran their fingers over the engraved surface, pointing out friends, former teammates and heroes. 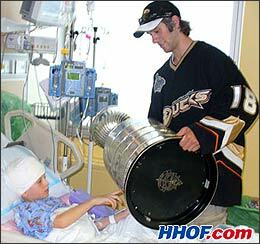 Drew took the Stanley Cup over to Sparrow Hospital and shared his victory with the children in the pediatrics ward. It wasn't his first visit there by any means, as he regularly visited the youngsters while attending college as part of the Spartan Buddies program. The visit lifted the spirits of the brave young souls currently staying at the hospital, who were buoyed by seeing the Stanley Cup and a real, live hockey player right there in their midst! And not just one, but two, as brother Ryan, the Buffalo Sabres' star goaltender, joined the visit, tremendously proud of his kid brother but careful not to get too close to the Cup, just in case it might jinx his own chances. "He'll win it someday. I know he will," smiled Drew. "He's been so supportive. He's not touching the Cup, but he's handling it very well." The pair stopped at the Lansing City Market, which will celebrate its centennial in 2009, then it was over to the Munn Ice Arena, where both Millers enjoyed so much success as Spartans. Several hundred fans were in wait of the Stanley Cup, and clapped furiously when Drew arrived just prior to 3:00. It was an extraordinary year for the Spartans, as the team is national hockey champion after claiming the NCAA trophy, and then, to top it off, one of its star alumni, Drew Miller, having played for the team from 2003-04 to 2005-06, collecting the Stanley Cup. A press conference was held, with both championship trophies looming large, and then Drew had pictures taken with various coaches. A former captain of the Spartans, Miller then greeted hundreds and hundreds of fans, who eagerly waited for an opportunity to get a photo with Drew and the Stanley Cup. By 4:30, having exhausted a full onslaught of media and fans, Miller took the legacy of Lord Stanley back to the family home. Great-Aunt Jean, a feisty 92 years old, could hardly wait to give Drew a big kiss, then got a little help as she, too, took a drink from hockey's championship trophy. "It's all about being with your family and friends," smiled Drew. "And just letting them experience it and enjoy it!" The enjoyment came fast and furious. 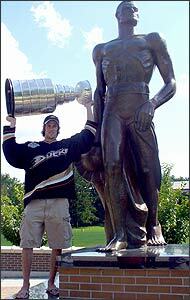 After spending the evening celebrating at home, Drew decided to show the Stanley Cup around East Lansing. "I want to introduce it to a few of the finer establishments around the area," he smirked, as he headed off to Lou & Harry's Grill. The fans were shocked but delighted to see the glorious Stanley Cup parked there next to their gyros, while cellphones snapped hundreds of shots. Next up was The Riv, formally known as the Riviera Café. It's hard to find a table anywhere in the bar that remains perfectly horizontal, but after a couple of well-placed coasters, the Stanley Cup was steady and fawned at by the amused and amazed locals enjoying a night on the town. 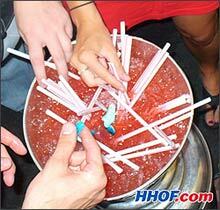 A close look at the bowl of the Stanley Cup filled with red liquid and gummy sharks by Drew Miller upon his last stop of the night at The Landshark club. The final stop of the night was The Landshark, an MSU institution and a requisite stop for Lord Stanley's mug. The revelers stopped and gasped as Drew walked into the club and placed the Stanley Cup right by the 'shark bowl'  a huge bowl filled with red liquid and gummy sharks in the bottom. By 3:30, the tank was empty (the gas tank, not the shark tank) and Drew bid the Stanley Cup adieu. "It still hasn't fully sunk in," he admitted. "It's kinda like a fairy tale!" 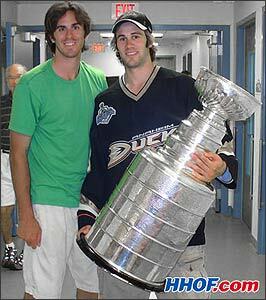 Be back again on Friday when the Stanley Cup spends time in Manitoba with Aaron Rome and Dustin Penner. 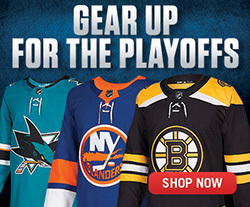 To find out all the details, come back and visit us at the Stanley Cup Journal.